Savory Pumpkin Cheddar Biscuits - a perfect match for a spicy bowl of chili! I can honestly say that I don’t miss bread. However, there are certain dishes that call out for a partner to help sop up some extra sauce or to calm down your taste buds after a hit of spicy heat. One of my old standbys was chili and corn muffins. I made a spicy chili the other day and thought a little, flaky biscuit would be a nice addition. I opened the pantry and pulled out a few staples: coconut flour, almond flour, coconut oil, arrowroot, and canned pumpkin. I always have a few cans of pumpkin on hand. Not pumpkin pie filling, just plain old canned pumpkin. It is so versatile and it’s one of my all time favorite flavors! 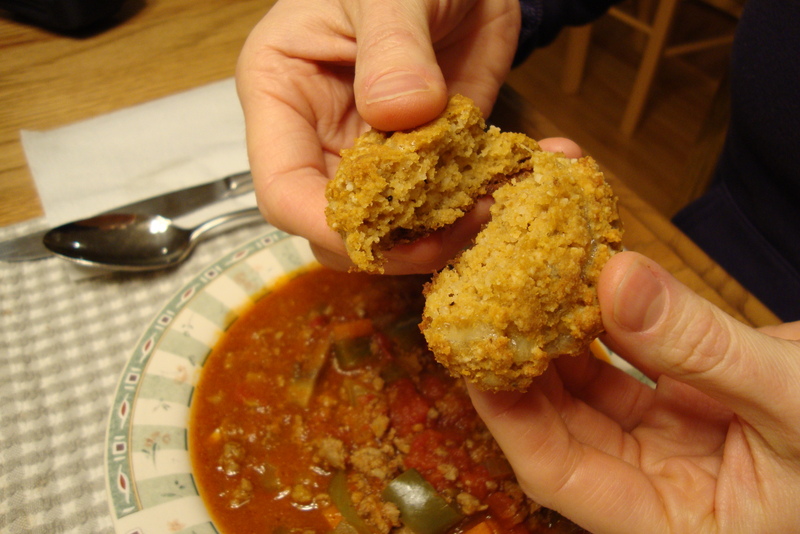 So here is the end result of my little biscuit experiment – little bites of goodness that matched up perfectly with a steamy, hot bowl of chili. And if you’re wondering what to do with the leftover canned pumpkin, try making my sister’s Pumpkin Bread Bars! Yum! Preheat the oven to 350 degrees. In a large bowl, combine all of the dry ingredients (almond flour through arrowroot). Using a pastry cutter or two knives, cut the cold coconut oil into the dry ingredients. It should look like little pebbles. This is what gives the biscuits the layered, flaky texture. In a smaller bowl, combine the wet ingredients (pumpkin, egg, apple cider vinegar). Add the wet ingredients and the shredded cheese to the dry ingredients and mix until just combined. Line a baking sheet with parchment paper. Using a medium size cookie scoop, or two tablespoons, divide out portions of dough on the baking sheet. Lightly flatten the tops of the biscuits and place them in the oven for 15 minutes or until golden brown. Almond flour, Apple cider vinegar, Cheese, Coconut flour, Coconut oil, Eggs, Gluten-free, Grain-free, Pumpkin. Bookmark.